ANN ARBOR, Mich. — University of Michigan head swimming and diving coach Mike Bottom announced Tuesday (June 26) the hiring of Nikki Kett as an assistant men’s and women’s swimming and diving coach. Kett arrives at Canham Natatorium after spending the last three years as an assistant at the University of Pennsylvania in Philadelphia. At Penn, Kett primarily worked with the women’s sprinters, while also serving as recruiting coordinator. This past year, she coached Virginia Burns to her fourth consecutive Ivy League title in the 500-yard freestyle and Quinn Scannell to an Ivy League record in the 200-yard backstroke. On the men’s side, she helped tutor Mark Andrew to a sweep in the 200- and 400-yard IMs, earning qualification for the NCAA Championships. In 2016, Kett’s first season at Penn, Chris Swanson became the school’s first national champion in the 1,650-yard freestyle. Prior to her stint at Penn, Kett was an assistant coach at Johns Hopkins University for three years. During her time in Baltimore, JHU had three top-five team finishes on the women’s side and three top-eight team finishes on the men’s side. 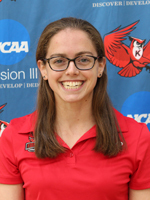 The program broke 47 school records and two NCAA D-III records, while she helped coach 59 All-Americans and 15 national champions (eight relay, seven individual). Additionally, Kett was named Women’s Assistant Coach of the Year at the 2013 College Swimming and Diving Awards. She has a master’s degree in kinesiology with a concentration in exercise and sports psychology from A.T. Still University in Mesa, Arizona. Additionally, Kett will graduate from Penn in August with a master’s degree in organizational dynamics, with her capstone project creating connected, high-performing teams. The above press release was posted by Swimming World in conjunction with University of Michigan Athletics. For press releases and advertising inquiries please contact Advertising@SwimmingWorld.com.